Meet Charlie, outbound support consultant and a valuable a member of the Applications Team at Bamboo. Read what he had to say about himself on our ongoing “A day in the life” series that highlight popular Bamboo Loans job functions, as seen through the eyes of their employees. Hi Charlie, tell us a bit about yourself, what do you do? 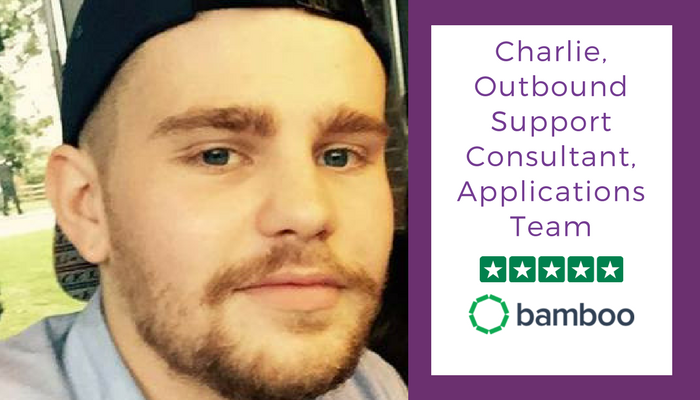 My name is Charlie and I work in the applications team at Bamboo as an outbound support consultant, my primary role here is contacting customers who have applied for a loan with us but need a little assistance completing their loan application. I answer inbound call queries from customers and brokers, as well as helping existing customers who want to borrow more money! So why did you decide to work for Bamboo, and what are your working hours? I decided to work at Bamboo as I was looking to further my career in financial services, the company is expanding quickly, with lots of opportunities to progress which makes for an exciting and fast paced atmosphere, this is something I’ve always looked for when joining a new company! The office is open from 8am-8pm Monday to Friday and 9am-2pm on Saturdays, however we work shifts in between these hours. I previously worked for the local council in their revenue and benefits department, this helped me gain customer service experience. It was a good way for me to start my career, but I felt I wanted something more from my working environment, which is when I was lucky enough to stumble upon Bamboo! I’m currently working on a new project to help see what strategies work best in the team. I’m also starting to learn more about my own department in terms of account management and day to day running of the team. Ahh, tough question but I have to go for the team I work in. We have a fun and friendly atmosphere which is continuing to grow in a fast pace working environment. For me it has to be the recent Loyalty project – offering top up loans to existing customers who need additional funds. It’s a new team for Bamboo and all the guys here including myself were excited. Although it was a hectic few weeks for some of us, I think we can all say it was interesting and great to be a part of the launch. I’ve also been working on strategies within the Applications team to increase our productivity which has been an interesting insight into how well we work and what is most effective for the team and for our customers. I try to keep busy and fit so I frequently partake in football. I tried to join a gym a few months back but after 3 months of only going twice I decided it wasn’t for me! I have an interest in various TV shows, my most recent obsession has been Game of Thrones, which everyone is talking about in the office! That I love working here! For me personally, it isn’t just about the job where we make sure every customer is given the best service but it’s also the people that work here, no matter what team they’re in everyone gets on really well which I think reflects on the service we give and the customer always feels welcome and a part of the Bamboo family! I believe that staying focused and having a positive mental attitude goes a long way in a work place. I’ve found this has become key to my own success and being able to manage my own work effectively has really helped me get to the position I’m at now! 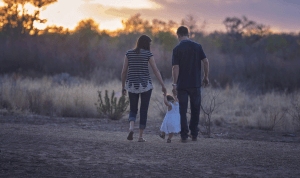 Please tell us your daily routine What does the typical day look like for you? I’m lucky enough to live locally which means my commute is only a 20 minute walk (or a 5 minute taxi when I don’t get up for my first alarm). The work day usually starts with my Team Leader sending me to the kitchen to make the first round of tea and coffee! I generate our lists of accounts for the team before they arrive so we are able to prioritise our workload. The structure of my day changes based on what shift I’m on. Lunch can start anytime from 12:00 to 15:30, my lunch is an hour long so I tend to walk to the City Centre which is only a five-minute walk and grab some lunch with a colleague, Nandos is a personal favourite of mine! Throughout the day I assist managing the work load with help from the team, answering inbound calls from our customers, calling to assist with applications and dealing with written correspondence from customers. 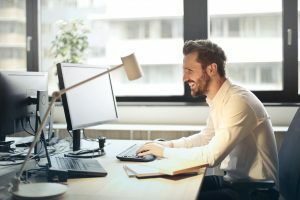 My day, as an outbound support consultant, can end anywhere from 16:30 to 20:00, once I leave the office I either go to the pub to socialise with work colleagues and friends or go home for some supper and maybe a movie or two before bed!